Please contact us if you would like to come meet Indy, or would like any more information. “Indy” is a lovely OTTB, who does not fit the typical Thoroughbred stereotype. This boy is absolutely adorable, with a great temperament as well! He has impressive lineage, with Smarty Jones as is sire, as well as having Canyon Creek and Mr. Prospector in his lines as well. He retired sound and very sane in October 2018 from the track. He has his down time and is ready to find his person. He is very well put together, with a classic, “long and low” appearance and correctness. His temperament is one that cannot be passed up. He is as sane as they come, very safe gelding to be around. Quiet, quiet, quiet under saddle. Indy has willingly taken everything in stride, and has never put a foot wrong. 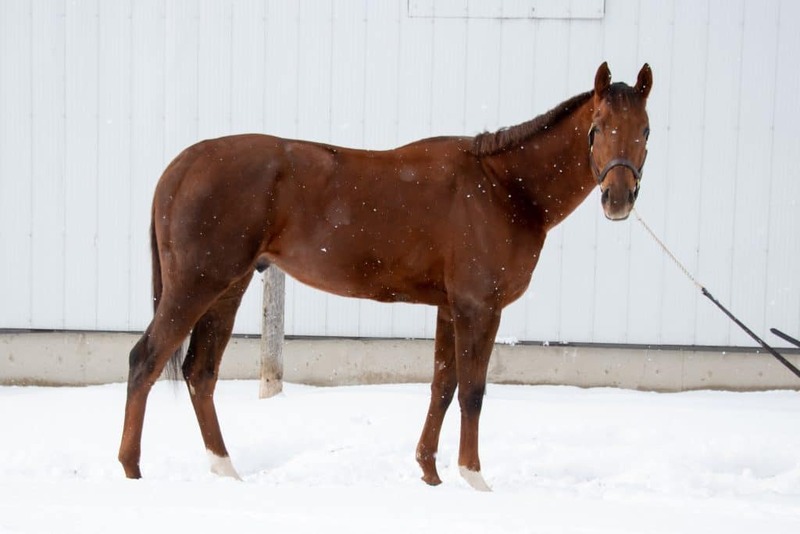 He’s athletic, willing and honest, making him very amateur friendly for someone looking for a nice ottb. He loves attention, and is well behaved both on the ground and under saddle. He has been exposed to many things, and been ridden in the snow without blinking an eye. Indy’s second ride off the track was a trail ride and he seemed to really enjoy it! Willing and safe. He has had two post track rides. Indy will make a competitive RRP mount, but really would be suited for any avenue post track. He has an amazing temperament, and natural athletic ability which would make re-training easy. He would even be suited for a young rider following a coach.